Breaking news. Living on Less Part 3 is going to have to wait- this post needs to be shared today! Here's the deal. Have you seen the infomercial for the body glitter tattoos? They're basically all the rage with kids. Some of my favorite little people saw them and instantly fell in love, and to be honest- so did I! The set on TV was crazy expensive so I looked for a better alternative to purchase in store. I found a set from Tulip at Michael's. The price tag was still $30, but much better than the infomercial price. 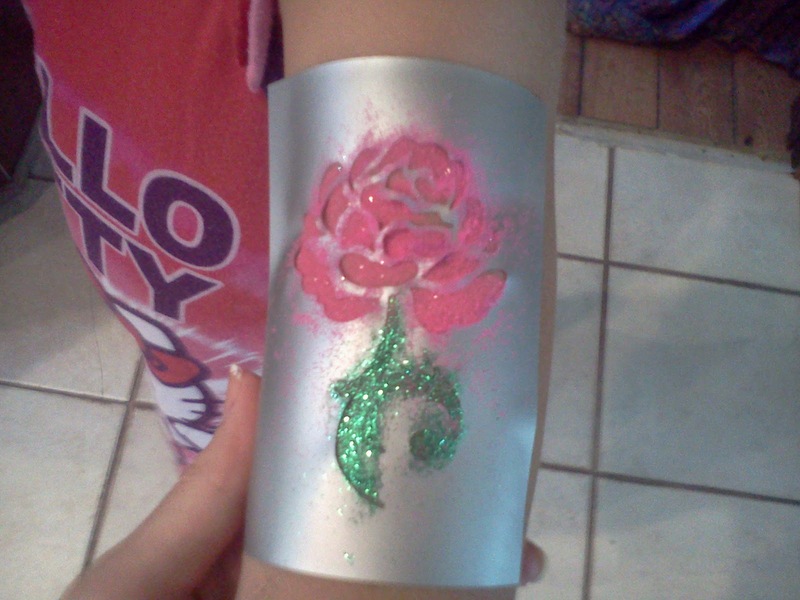 I gave it to one of the siblings for her birthday and today we busted it out to make some crazy glitter goodness. The glue it came with was entirely dried up into a rubber form. You cannot imagine the disappointment (though they handled it well). I decided on the spot to make my own with on-site materials and it totally worked! This version may not last as long as the others (which are rumored to last 5 days- though the package has a warning of, 'results may vary'...), but they are just as nice looking and CHEAP! Please excuse the pictures, they were taken with my less-than-ideal camera (except for the heart). Glitter: I get a 4 pack of these at Michael's for $1! (1) Stencil it. Create your own stencils using contact paper. The stencils that come in the kit are just as flimsy and the adhesive is too strong. Both kids that used one yelped and said it hurt extremely bad to take off, one of the girls was on the verge of tears. However, you can trace a design on to the contact paper and then cut it out OR you can use one of the punchers from the store to make it even easier. (or free hand it if you rock) Apply to clean, dry skin. (2) Glue it. Whichever adhesive you choose, apply it until it is on thin and evenly. Both of these glues are non-toxic so I have to think that they're just as safe as the adhesive shipped with the other big brands of Body Glitter Tattoos. (3) Apply it. Next, apply your glitter color(s) using the eye shadow or paint brush. 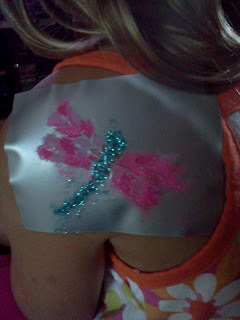 It works best if you actually remove the stencil BEFORE adding the glitter, so go that route. (4) Dry it. Remove your stencil and allow the tattoo to dry. I washed my tester off my arm off with soap and water about an hour later, but they hold up pretty well. They did come off in the pool, though. Easy and cheap! I am so glad we made our own. The only plus side to the Tulip kit is that it comes with body paint, which is fun. You could definitely make this into an awesome kit for a child's birthday. Put your own label over the glue stick OR pour some of the white Elmer's into an old lip gloss tube. Get a few of the cheap E.L.F. eye shadow brushes, nice/angled Q-tips or paintbrushes, the Michael's glitter and some contact paper (cut into little sheets). You could even run the contact paper through the printer to make designs in advance. Easy, inexpensive and sure to be fun! Don't forget to print out a directions card :) OH! Maybe I'll make a free printable to go with this!! Holla! Done. Feel free to use this OR to make it more gender/child specific. That's it for today- so sorry to be late! But I wanted to share our discovery with you. If you wanted to see the third installment in our Living on Less series- I *promise* to post it tomorrow. Have a great day and as always, thanks for reading! For the love of God DO NOT GIVE YOUR CHILD GLITTER. My little sister's nickname is Sparkle. Don't ask. I'm curious about modpodge also. It is safe on skin and may last longer.... worth a shot anyways. speaking of ELF products, they have an Studio Makeup Lock & Seal that is essentially made for this. Mix a few drops of this stuff with eyeshadow (to color) and/or glitter, and then paint it on however you like. 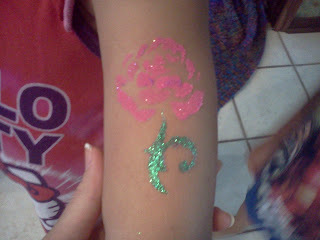 I haven't used it with stencils, but I have used it to keep glitter in place for HOURS. Doubt it would hold up in the pool either, but throughout most of a birthday party? Sure thing. 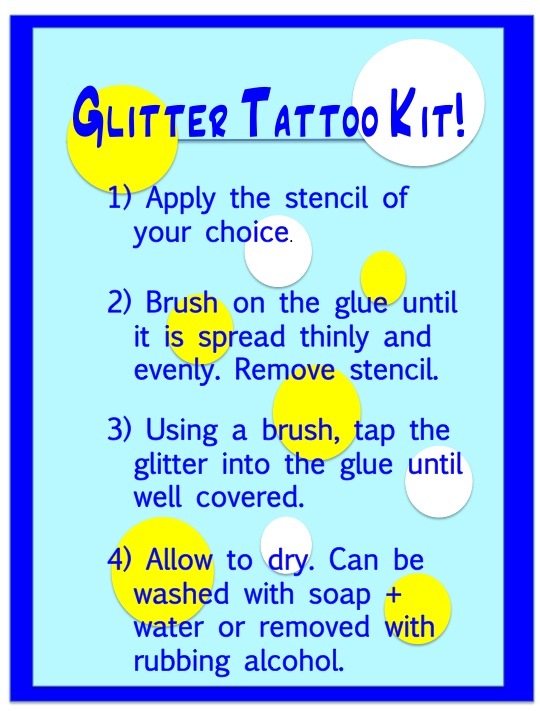 Ben Nye has a more expensive, longer lasting version of this... but for ~$3, the ELF product would be perfect for doing glitter tattoos at a kids party. of course! :o) I am becoming a big fan of ELF these days -- they have some real hidden gems in their line-up, and none of the ingredients look too scary for kid-use (unlike some of the professional special fx makeups available!). Girl- you are speaking my language! vive toxin-free products!!! I'm not sure how you might feel about hairspray. But, I use hairspray in a light coat over the tattoo. It helps it last longer! I'm sure there are some organic or natural hair products that would do the trick in a jiffy! Generally I'm not a fan of it- BUT i did get sent a nice natural kind for my product review this month that worked pretty well-- great idea!!! Thanks so much for adding that! 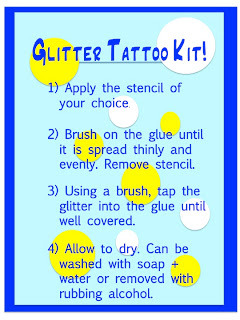 This is a great kit for temporary glitter tattoo! A lot of fashion and beauty enthusiasts will surely be thrilled to have one of these. Thanks for sharing. troloe 391essional body artist and extremely familiar with glitter tattoos. The glue that comes with most kits is an acrylic based hypoallergenic body glue and the glitter is cosmetic grade plastic glitter. Please use caution when trying other glues and glitters. Just because it is "non-toxic" does not mean it is safe! There are much more affordable kits available online from sites that sell body art/face painting supplies as well as Amazon and Ebay. My career depends not only my artistic ability as well as the quality of the supplies I use. Thanks for weighing in, Arianne! Sure do appreciate it. I'm kind of a chemical freak (which you'll see if you stick around on the site, haha!). I actually discourage everyone from using general market makeup + products because it is SO toxic for us over a long period of time. Elmer's doesn't release the ingredients in their washable school glue because it is considered proprietary information, but here is a link (bottom) from the company disclosing any health hazards for anyone concerned. It's true- just because it says "non-toxic" doesn't make it so! Half of the sunscreens (or more!!) on the market are basically poison. But even being the chemical freak I am, the school glue doesn't scare me. I used to practically COAT myself in that stuff as a kid, haha! I wonder how the craft spray adhesive would work in a pinch! hm... I don't know- I think standard Elmer's school glue sounds a little safer and more tacky?